The Canon EOS 6D is a DSLR arriving by no surprise. Is it underrated? I initially thought Canon wants to use the EOS 6D to combat against the Nikon D600. There is no wonder that their specifications are neck to neck. Canon clearly positions the EOS 6D between the EOS 5D Mark III and the EOS 7D. It is the entry level full frame camera in Canon’s camera line-up. So please don’t compare it with the EOS 5D Mark III. If you want to see a comparison between the Canon 6D, Canon 5D Mark III and Nikon D600, go and see for yourself for the details on Digital Photography Review. The 6D has surprised me by many amazing facts, for instances, its size and weight. It is obviously smaller than my aged old 40D when placed them side by side. 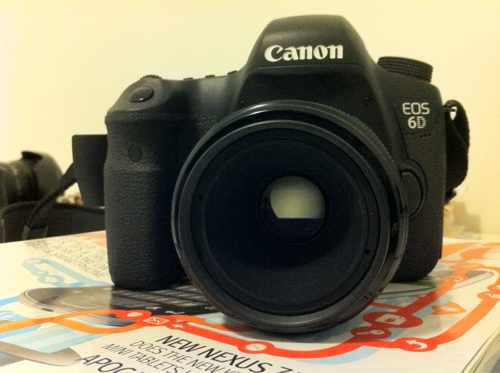 I thought the Canon EOS 6D might be lighter too. As I said the Canon EOS 6D is also a full frame (a slightly smaller size than the 5D Mark III) camera, so you don’t have to worry about the crop factor (x 1.6) of your lenses. Your 50mm standard lens is still 50mm, not becoming 80mm when mounted on a EOS 7D or even on the newly released 70D. But in real world when talking photographs, who cares the crop factor or the full frame? You use your eyes to see and your heart to capture the decisive moment. The truth is that any camera is able to make powerful images. You may criticise that the top plate of the Canon EOS 6D is made of plastic. However, to make WiFi connection available without attaching an external module like the EOS 1Dx, this is a cut-cost solution. Don’t forget in this way you do not have to spend any extra money to buy any accessories. Yes I must admit that it may be more vulnerable to punch, direct impact or damage. But I am afraid you won’t be able to find out the performance of a camera by this silly method. Unfortunately at the moment connecting to the iPad seems having an issue and Canon says tablet connection is not assured. Otherwise this will be a great tool when shooting video with help of the retina display of the iPad. I do hope Canon will consider seriously upgrading this app or designing an app for iPad. Perhaps this will also be a great idea if this app can be used with other Canon DSLRs with no built-in WiFi connectivity. The Canon EOS 6D is also great in video capture. I cannot say too much as I have not tried extensively with it in my latest travel. Prehpas my video in production may tell. Recently Michael Reichmann’s article called Ten Commandments of Cinematography for Still Photographers should help a lot if you want to use a DSLR to make a video. By the way, Michael’s website has many fantastic writings about photography. I strongly recommend you to read from time to time. What about the image quality of the photographs produced by the Canon EOS 6D? Overall the image is clean and exposure is right at all times. It is a mighty tool if you set the mode to full auto. The camera automatically adjusts the ISO and other exposure values. I have used it in taking group photography in some events and the exposure was much better than those taken with flash. Of course you can see the grain. But you can process the image under Adobe Lightroom or Adobe Photoshop to reduce the grain. In reality, the images taken in high ISO are highly usable and acceptable. Some may also criticise there is only one SD card (not Compact Flash card any more) slot on the camera body. But today SD cards are common and even buying one spare is not really hard to find in locations such as some gas stations in remote Iceland. You may think of using a massive storage SD card such as SanDisk 64GB SDXC card on the Canon EOS 6D for shooting videos. I have tried it and found no hassle at all taking images and videos. One of the accessories you may also need is a spare battery. Should we upgrade to the Canon EOS 6D? If you have a stock of Canon lenses and you need a full frame body at an affordable price tag, this is the one. It has won the EISA Photo Award 2013-2014 and deserves to take a further look. Will Leica enter the mirrorless?